You’ve probably heard about the event when a small wish made by a five-year-old leukemia survivor blossomed into a social media feel-good event of the year. Panels in Hall H at San Diego Comic-Con may have been packed with lines that started the day before the panels, but the panel for the crowdsourcing campaign for “Batkid Begins” represented a moment in time when the hearts of 25,000 people in San Francisco and 2 billion people worldwide through social media were captivated by Batkid. 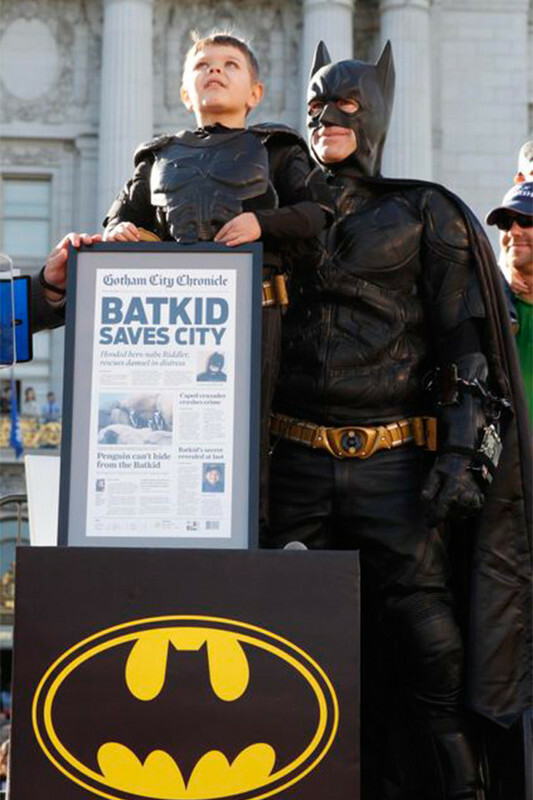 Last year, on November 15, San Francisco was turned into Gotham City for one of the most elaborate Make-A-Wish projects. The San Francisco Chronicle published a “Gotham City Chronicle,” the real police chief recorded special messages to call for Batman (Eric Johnston) with his trusty sidekick Batkid to save the day. Originally, Miles was told he was venturing away from his hometown of Tule Lake, CA to pick up a Batman costume in San Francisco. At the hotel, a local TV news broadcast was interrupted with an emergency call for help from police chief Greg Suhr. When Patricia Wilson of Make-A-Wish Foundation in San Francisco began planning an event for Miles Scott, they hoped for a crowd of 200. And she told the SDCC crowd, “I don’t care what the police chief says, I only asked for 2 cops.” In the end. Academy Award-winning composer Hans Zimmer ("The Lion King") wrote a personalized Batcall for Batkid, 18 Lamborghinis were offered, Apple and Twitter offered to help with the media and Batkid was congratulated by President Obama on Twitter. The teaser shown to the SDCC crowd left more than a few audience members sniffling. For the panel, Mashable’s deputy editor Chris Taylor acted as emcee introducing the Emmy Award-winning director Dana Nachman (“Witch Hunt,” “Love Hate Love” and “The Human Experiment”), Make-A-Wish director Wilson, Batkid’s Batman (inventor and software engineer Eric Johnston) and the damsel saved from a Riddler’s fiendish bomb (Sue Graham Johnston, Eric’s wife) and Batkid’s Penguin (Lucasfilm software engineer Mike Jutan). Jutan described how the Penguin waddle evolved and why the Penguin was chosen over, say the Joker. “Caesar Romero’s Joker was too scary for a five-year-old. The Penguin, he’s a silly, waddley guy.” Then there was getting the mascot of the San Francisco Giants, Lou Seal, to AT&T Park so that Batkid could save Lou Seal from the Penguin. The day overwhelmed the small cast of volunteers and crashed the Make-A-Wish website. Sue Graham Johnston had no idea so many people would surround her, pushing microphones into her face as she waited to be rescued by Batkid. That proved more frightening than the neon green bomb. Batkid Day may be over, but this team hopes to finish this documentary. There’s more than enough photos and video to use, but the “Batkid Begins” Indiegogo campaign is currently at 48 percent ($47,850 out of the goal of $100,000). The campaign started mid-July, runs until August 19. Perks include Batkid T-shirts and baseball hats. There’s already a 10-minute video “Batkid: The Official Make-A-Wish Story” produced by John Crane Films and directed by John Crane, but “Batkid Begin” would be more detailed look into the events, including background material about Miles’ parents, Nick and Natalie. Some superheroes need super powers. Some superheroes have no problem getting their movies made about fictional feats of dare-doing. Some superheroes need a large cast and crew and a big budget. Not this one. Batkid brought together one city with a simple and naïve wish. Holy social media, Batman. Sometimes the Internet and social media can help fight the forces of evil, and bring a city together, united against a common enemy (cancer), if you have just the right kind of super hero. For San Francisco in November 2013, that hero was Batkid.